"Doll wearing habit worn by Daughters of the Most Blessed Trinity"
Plastic doll is wearing a habit worn by the Daughters of the Most Blessed Trinity. The order was founded by Bishop Peter Sarpong in Ghana in 1984. 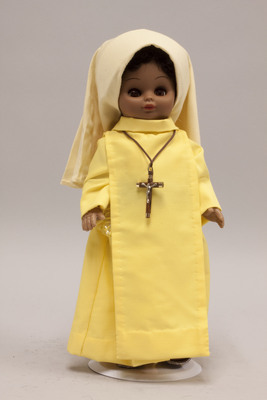 The doll is wearing a yellow dress, yellow scapular, and yellow veil. A wood and metal crucifix hangs from a cord necklace around the doll's neck.